Still more Sonic clothes to keep you warm. 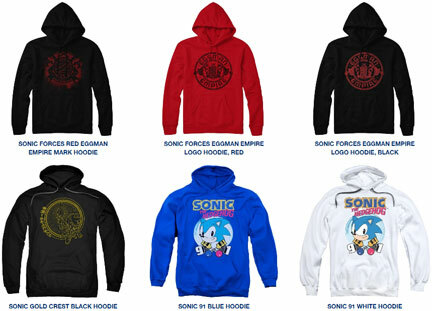 Sonic sweatshirts/hoodies/long sleeved items used to be uncommon in the past, but thanks to the current efforts of the Sega Shop Online. Warm weather clothing may be more expensive, but the designs are still pretty cool. 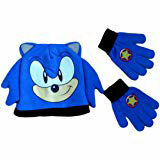 So if you've got to go out in the cold, it might as well be with some cool Sonic stuff! Check out the many different designs you can collect here, along with listings of where to get them, if known. More from the "Somewhat Subtle Sonic" selections at the Sega Shop. 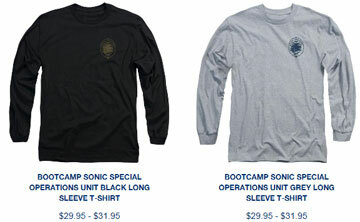 These are the "Bootcamp Sonic Special Operations Unit Long Sleeve T-Shirts". They're adults sizes only, and about 30 dollars each. They're a simple variant of each other, either black with tan logo, or gray with blue logo. The logo is small on the upper chest area, off to one side. It is the 'military patch looking' small Sonic face in an oval with some stripes. There isn't anything particularly 'special operation' about the small logo from the Forces game, but it's an ok tee if you needed something that's winter-ready but also pretty plain. Here are 6 more Sweat Shirts from the Sega Shop in the fall of 2018. Each one is a hoodie, and is adult sizes only. The first one is all black with a red "Eggman Empire Mark" graphic (seen elsewhere in more detail) The next 2 are just variants of eachother with opposite color red/black graphic and black/red graphic. These have the Eggman Empire logo from Sonic Forces. The fourth is the "Gold Crest", which is the detailed yellow line art of modern Sonic in a 'radiating lines' ring shape with curved Japanese text down one edge. The last two are variants again, either blue or white. They have the same design in the same colors. It's the classic logo with Sonic portrait & the numbers "9 1" there are two 'midway goal post' things in their 'mid hit' position sort of criss-crossed to represent/break up the "1991" although that's slightly confusing. As usual, they're 35 to 40 dollars each. It's a head. For your head. Will you have double head power when you use this wacky hat? 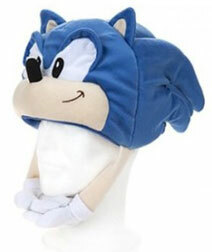 Probably not, but this version of the 'plush head hat' (of which there are many) adds a new level of silliness which is small Sonic arms that grow out of the bottom of the head, and velcro together under the chin to make the hat literally hold onto your head. The spikes are plush/stuffed, as is the face, to give it some shape independent of any head inside. The Sonic rendition here is classic, with black eyes & normal smile. The ears actually do stand up, and the face proportion is actually pretty ok for such a sort of odd item. This is supposed to be on Amazon somewhere, but what company made it? 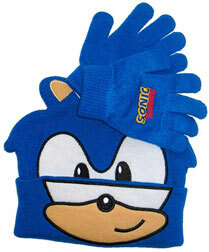 It is sure one of the wackier Sonic merchandise items out there, but it is good for a laugh when you see it. BioWorld remains back in action with classic style stuff in 2018. Here's yet another (how many are there now?) version of "Sonic's face is on a knit cap or beanie". However, this time, the lower part of the face is printed on the roll up/over area for some reason. Why do this? It divides the eyes and makes the design confusing. Are the rest of the eyes double-designed onto the part under the roll up cuff? A blue line going right through the face seems odd. Notice that the top of the hat does have little flappy ears, and there are small kind of 'wimpy looking' 'spikes' for the sides of the head. The hat also comes with blue ordinary stretchy-knit fabric gloves. The gloves have the classic logo on them, in color that is a thin textured rubber stamp type item. This is also supposed to be at Amazon, but is it also in stores like Spencers? How much does it cost? Here are SIX sweatshirts with JUST TAILS as the star. Tails doesn't appear alone nearly as frequently as Sonic, so any of these are really cool to see. These all arrived in the Sega Shop online at about the same time which was late summer 2018 through fall & winter. The first 2 are just a black / white variant of each other. It has Tails in the winged ring & the "25th Anniversary" logo on the ribbon under him. The 3rd shirt is dark navy blue with a small Tails face patch in one upper corner. 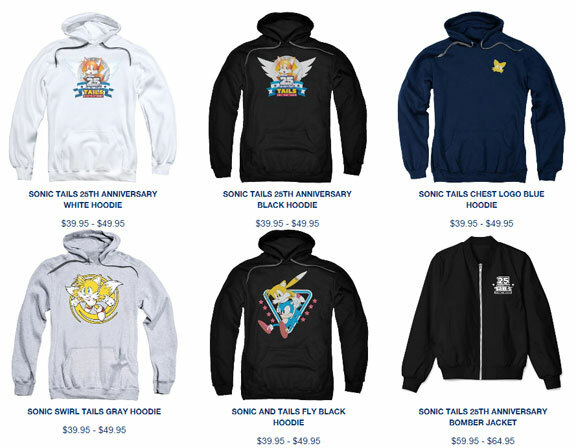 The "Sonic Swirl" hoodie is gray, but it has flying-forward modern Tails in that 'spin' shape, but it's yellowish. The 5th is classic style with some neo-classic Japanese-styled art of flying Tails carrying feet-lifted Sonic in front of a triangle & stars design. The last is a zip-front coat they're calling "Bomber Jacket" which just has a white 25th logo, but Tails' name replaces the "Sonic the Hedgehog" portion on the ribbon. Note that it is more expensive at 60 to 65 dollars. Here goes yet another 'big face' classic winter hat. (How many very similar ones of these are there now? Lots) But, this one is still a little different than the previous, but mostly because it comes with a pair of gloves with star bumper pictures on the backs. These have a black cuff too, unlike previous pairs. The hat does a bit of a different approach with the spikes, this time making them a pair of kind of odd flaps on the sides. Because the whole thing is some type of knit, they're a bit rounded. There are little ears on the top of the hat, but the bottom doesn't roll up/cuff. It's an ok 'costume style' a little bit hat if you didn't already have something similar. This is a late 2018 item. This hoodie is an oddity. It's called "Costume Hoodie", and it comes off as rather strange instead of cool. The hood features one of those 'screen-fabric' "Masks" like some of the super hero hoodies that were a fad. This is a mesh with a design printed on it. When the mesh is close to your face, you can see through it......fairly...well? (Not the best/reduced vision) But, as you can see here from a distance, all you see is the pattern, which is Sonic's eyes/forehead. It's an ok idea, but it's quickly spoiled by the mutant wonky spikes. These are too thin, strangely curved, look skimpy & just fake and odd. The ears are small cones. There's the belly dot on the zip up front, and the sleeve cuffs are white to represent glove cuffs. This is too wacky/bonkers to wear as a casual item, but it's not costume enough for Halloween or convention cosplay...so what is it's aim exactly? This is a teens size thing too...so it's not like a cutie-toddler-dress-up thing for them. Supposedly this is on Amazon somewhere but what to even do with it if you do find it? Numskull is back with another quality product! They don't make Sonic stuff often, but it seems when they do...real thought goes into it. 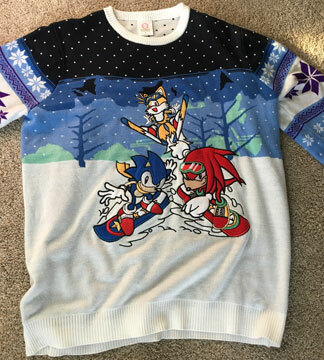 This is a winter themed sweater featuring Sonic, Tails & Knuckles doing snow sports. However, look at the Tails art, it is new! Is it unique to this sweater? Maybe. He's doing a trick on skiis, while doing an all new pose & wearing ski goggles. Below him on the snowy hill are Sonic in a scarf on his blue/star snow board and Knuckles in his Riders goggles on his red snow board. Knuckles is likely riders art, as is Sonic. The characters are made of a different fabric than the sweater itself (which is a soft weave, not that thick yarn stuff) & they're held down by the black embroidery borders. Each character also features an embroidered face & details. Look at what attention they were paying to Knuckles...the red tone of his head is even adjusted to make an authentic glare on the goggles! 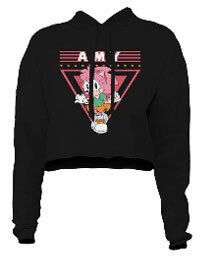 This is a 'crop style' hoodie featuring Amy Rose! Neoclassic running forward Amy art is in full color in a pink triangle on the front. Her name is spelled out in a white font at the top, with pink lines as the background. The way the design/name/character and background are laid out, gives it an almost deco/80s feel. The 'black lines' aren't really there, they just took the picture while the hoodie draw-strings were laying in front of the design. Notice the proportions of the sweat shirt. The sleeves are normal length...it's just that the 'torso' part is extra short. Why though? It would probably stop at like...the bottom of the ribs area or so? Maybe this was also an 80s style? The unuaul style, nice neoclassic art and good design work makes this sweat shirt feel fresh. It is a 2018 / 2019 item in the Sega Shop online, and should be about 40 dollars. It is sized for adult women. Here's a strange sweater with a somewhat odd classic design. It's a plain dark navy blue sweater with a little scene on the front. 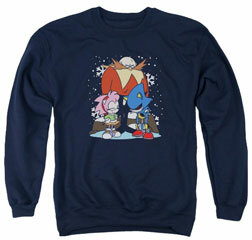 On a snowy day, Eggman, Amy Rose & Metal Sonic are....standing around? Eggman is just kinda...there...looking down somewhat glumly? Amy is standing cheerfully, with her hands on her hips and her eyelids closed. Metal Sonic is standing with head fully down / almost hanging (it's kind of like how the games pose the sprite when he is meant to be 'inactive' or 'not awake') Big snowflakes are falling in the background. 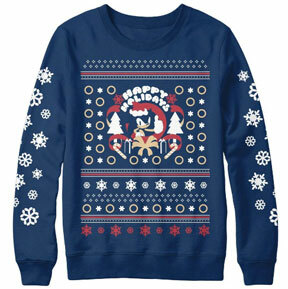 This is called the "Sonic Happy Holidays" sweatshirt. It's another sweat shirt made to look like the popular 'ugly Christmas sweater', without being made of sweater material. This one isn't too ugly though, it's just rather busy. It has lots of different, fun snowflakes on the long sleeves. Sonic is doing a thumbs up in a red circle in the middle, while wearing a Santa hat. "Happy Holidays" is written among ribbons and white pine trees, while candy canes & bows are below. The pattern for the very large (nearly the entire front, much larger than standard designs) rest of the design is snowflakes, snowballs, rings & stripes in various holiday colors. The whole sweatshirt appears to be a dark blue, it's almost the same color as the Sonic picture. Amy Rose is having fun in the snow! This mottled gray sweat shirt features a new design with classic Amy. Her usual top has been changed to a light green sweater with white fluffy trim, but she's still got her purple sneakers and ruffle skirt. She is shown smiling in front of her silly Snow-Sonic creation. She has built a slightly spiky snowman (complete with buttons and scarf) but the had sort of looks like Sonic. What is that big orange dot in the background? Is it the sun? Why is there a small flower blooming behind her? Flowers don't go up in winter, and snow melts by the time a flower would bloom. The flower & orange dot make the scene a little bit strange. 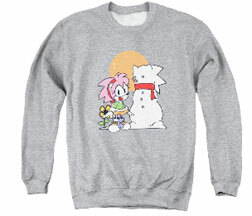 This is a 2019/winter Sega Shop item, and is 40 dollars in adult sizes. Here we go again with another "Tacky on Purpose" sweater for the holidays. Will Ugly Christmas Sweater trend eventually bite buyers back when they go out of 'funny-parody-fashion'? 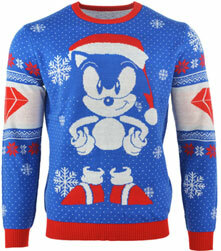 Who knows...but in the meantime, here comes classic style Sonic in a Santa cap real big on the front of this one. The whole sweater is blue, with random white snowflake pattern, and lots of tiny dots just to make sure it feels busy. Forward-facing hands/hips Sonic almost blends in with the background, but he has some outlinining, and all his details are white. Notice that the upper-arm part of the long sleeves has a red chaos emerald for each, among bands of red and white snowflakes. The emeralds really are a great touch, because they add another Sonic element, while keeping with the oddball theme. This is likely to be a Numskull item in late 2018.